Tiny Tears Dolls – The Most Popular Vinyl Doll – Launched in a blaze of publicity in 1965, amazingly Tiny Tears dolls are still sold today – and the earliest ones are becoming exceedingly collectable. At the time, Palitoy was one of Britain’s largest toy manufacturers, and their revolutionary doll went on to win the ‘Toy of the Year’ award no less than three times. But what made this vinyl doll any different to the hundreds of others on the market at the time? Well, not only she could she shed ‘real’ tears and wet her nappy, additionally her limbs were attached with unique rotational joints, causing her to fall naturally into a floppy, babylike position when she was held. 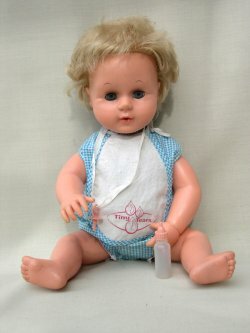 The very first, 1965, Tiny Tears doll was 16″ high with fine pale blonde hair and blue sleeping eyes. The back of her neck was marked ‘Made in England 16D’. She had delicate features, a small, pursed mouth, wore a turquoise or pink gingham romper and came with a bib, bottle and a dummy. This doll proved so popular that a year later Palitoy produced a smaller version, Teeny Tiny Tears, just 12″ high. Shortly after, Palitoy became part of the American company, General Mills Inc., who decided to keep the Palitoy name. Sometimes today collectors come across a baby doll similar to Tiny Tears but with a smiling face. This is Baby Flopsy, issued around the same time and advertised as being able to wear Teeny Tiny Tears outfits. She was sold wearing just a nappy. Five years after the initial launch, Tiny Tears was given a complete revamp which made her appear older; her delicate face was more rounded, her eyes were larger, her mouth wider and her hair was thicker. This is the face which most people remember, and it was to stay the same for the next fifteen years. She was marked ‘Palitoy’ on the back of the neck. One of her most popular outfits was a white nylon dress with blue and pink smocking on the yoke, and she was sold in this from 1973 to 1980, at a recommended retail price of œ7.99. Tiny Tears dolls came with guarantees and gift certificates, as well as instructions on how to feed the doll and make her cry. The tear mechanism was activated by ‘feeding’ the doll with water, quickly inserting a dummy to prevent the water trickling out of the mouth, and then squeezing her tummy hard. She would wet her nappy at the same time, probably due to shock! To mark the next decade, Tiny Tears was given a pretty cotton dress with a floral design in either pink or blue, and, at first, matching pants and bonnet, though soon a nappy was substituted for the pants while the bonnet was discarded. The eye-catching box read ‘She’s as cute and cuddly as a real baby. Just like a real baby she cries real tiny tears.’ The decade also heralded a new addition, the little Teeny Weeny Tiny Tears, just 9″ tall, who is now extremely popular with collectors and quite hard to find. A Tiny Tears logo was introduced, shaped like a yellow ‘sun-ray’, to decorate clothing and accessories, and in 1982, the floral outfit was updated to a white cotton dress trimmed with blue gingham. Three years later one of the prettiest versions of Tiny Tears appeared. Her ash-blonde hair was very thick and curly, her face was slimmer, and she wore a distinctive all-in-one jump-suit consisting of pink and blue spotted trousers over a white and blue striped top, with the words ‘Tiny Tears’ embroidered in blue on the trouser bib. Although the boxes of these dolls were labelled ‘Palitoy’, the actual doll bore no mark. It was around this time that General Mills withdrew from the toy scene and for a while, it seemed that Tiny Tears would disappear too. However, you can’t keep a popular doll down, and soon she was back, now produced by Tonka Toys, who introduced a brunette version as well as the standard blonde. It was Tonka who were responsible for one of the more unusual innovations when, in 1988, they gave Tiny Tears ‘flirty’ eyes, which moved from side to side. At the same time, they revamped her body, giving her realistically-curled fingers. This roving-eye doll is very collectable, but be careful, because the delicate eye mechanism is often damaged. When Tiny Tears celebrated her 25th birthday in 1990 (sold in a special anniversary presentation box) she was given a complete makeover, and reverted to the original delicate features. Tonka introduced two new dolls to the range. 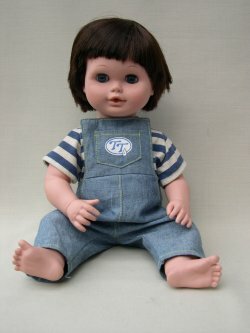 Timmy Tears, still a favourite today, and advertised as Tiny Tears’ twin brother, had dark hair, a saucy face, and wore a white and navy dungaree suit. He had the same crying and wetting abilities as his twin. 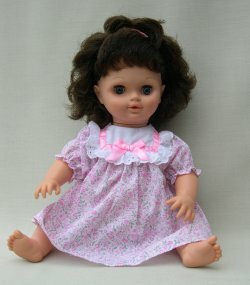 The other addition was big sister Katie, who was a triumph, and one of the prettiest dolls on the market at the time. She was dainty, with a sweet face and, at 17″ tall, an inch taller than her siblings. Her outfit consisted of a white-spotted cerise or navy dress, and though she wasn’t a crying doll, she could do something even more clever – she could grow her hair! Around her neck hung a large plastic locket containing a pull cord, which enabled the hair to be wound in or out from her head, and an additional hairpiece was included in her box. Katie was soon discontinued, and is today one of the most sought-after of the Tiny Tears collection. During this period, the who-owned-whom became complicated. A spokes-person, writing in 1998 on behalf of Playmates Toys, a more recent owner of Tiny Tears, states that General Mills was bought out by Tonka and ‘eventually Kenner Parker. The company stayed Kenner Parker up until about 5 years ago (1992), when it was bought out by Hasbro, however the company still remained with the name Kenner Parker, which became a part of the Hasbro umbrella.’ Time for another change of ownership – the rights were sold to Ideal in 1993. Just two years later, Tiny Tears celebrated her 30th birthday, and a very special Tiny Tears was made to celebrate the occasion. Her pale blonde hair was fine and short, just like the original, and she wore a pale pink dress. This Tiny Tears was sold as ‘Birthday Party’, in a special box, complete with hat, cassette tape, banner and present, and today these sets are in great demand with collectors, but are quite hard to find. 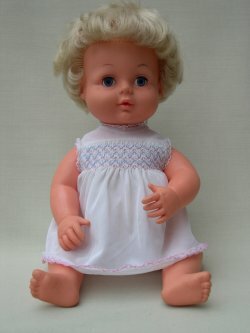 The standard Ideal Tiny Tears dolls had longer blonde or brunette hair, often tied with a ribbon, and were dressed in colourful cotton frocks. According to the catalogue, they had a ‘softer, new look’. Although this was a pretty doll, Ideal made a change which upset many collectors – they abolished the distinctive rotational hip joints. In a more creative move, they inserted a one-way valve into her mouth, which meant a dummy was no longer required. 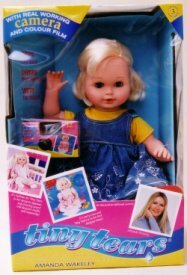 Ideal also launched an innovative soft-bodied ‘My First Tiny Tears’ with vinyl face and hands, before passing production of the series over to Playmates, who introduced the much-vaunted ‘Amanda Wakely’ collection dolls, featuring a range of smart outfits created by the famous fashion designer. Tiny Tears was given a side-parted short hair-style for a while, before reverting to a slightly longer style. These Playmates dolls are made from a much firmer, high quality vinyl than before, and it was this company who issued the ‘First Tiny Tears’ range dressed as bears and rabbits. Now, the doll is once more with Ideal, flaunting a new, babyish, resculptured face. American collectors have their own Tiny Tears doll, first issued in 1950. Much more babylike in appearance than the British doll, the American version is made by the American Character Doll Company. When she was first issued, she was packed in her own case with plenty of accessories, including a miniature bubble pipe and advertised as ‘she cries real, wet tears!’From the collecting point of view, it’s intriguing to see the changes in style of Tiny Tears dolls under the hands of various manufacturers. Prices of the earlier Palitoy dolls have risen dramatically over the past ten years, making a doll in mint condition a worthwhile buy.